When going on an adventure in the wilderness, the most basic of all shelters is the tarp canopy. It is easy to set up and can be very versatile to be pitched as suited for the conditions. A tent can be very heavy to carry around with you on your camping trip. That is why many people choose the more lightweight solution in tarp canopies. Plus, in case of bad weather it is faster to pitch if compared to a tent. Without the right know-how however, setting up a tarp canopy can be as much of a hassle as setting up a tent. Hence to make your camping trip easier and comfortable, we will tell you the easy ways on how to set up a tarp canopy. First look for a suitable place where you can set up your tarp. Ideally a flat ground where the trees are spaced apart is a good place to pitch. Look for dead branches above your location as well because they could possibly fall on you in rough weather. A regular tent-like pitch which can protect you from the rain and sun but not the bugs. This is used in places where there are not a lot of bugs or with a bug net, or for those who enjoys hammock camping. You can make this pitch by first throwing a line between two trees, throw your tarp over the lines and lastly stake down the sides. Eureka! A quick A-frame. If you cannot find any trees around you then poles can do the trick as well. Check out what are the best tarps on the market. The disadvantage of this design is that there are no floors and is susceptible to sagging if the line is not tight enough. This is one of the most popular styles. 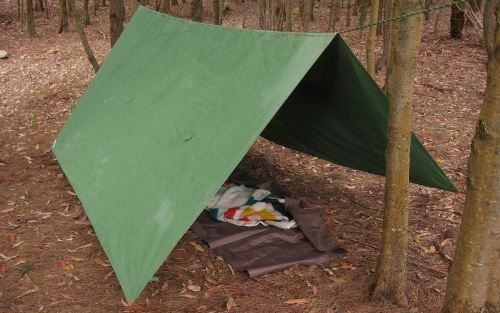 It can be made by again throwing a line between two solid trees, attach one of the edges of your tarp to it and stake the opposite edge to the ground. You want the side of the tarp, that is staked to the ground, to be facing the prevailing winds. Also make sure that your tarp is snug and tight or else it will flop around in the wind and irritate you a lot through the night. The disadvantage of this design is that there is no floor and protection from the sun or wind is only provided from one side. For those who like a layer of tarp to be under their sleeping bags, building a tube tent is the way to go. Tie the rope around a tree and stake down the other side. Do make sure that the side that is staked to the ground is facing the prevailing winds. Throw the tarp over the line, stretch out the corners and stake down each side. The disadvantage of this design is that there is not much room inside. 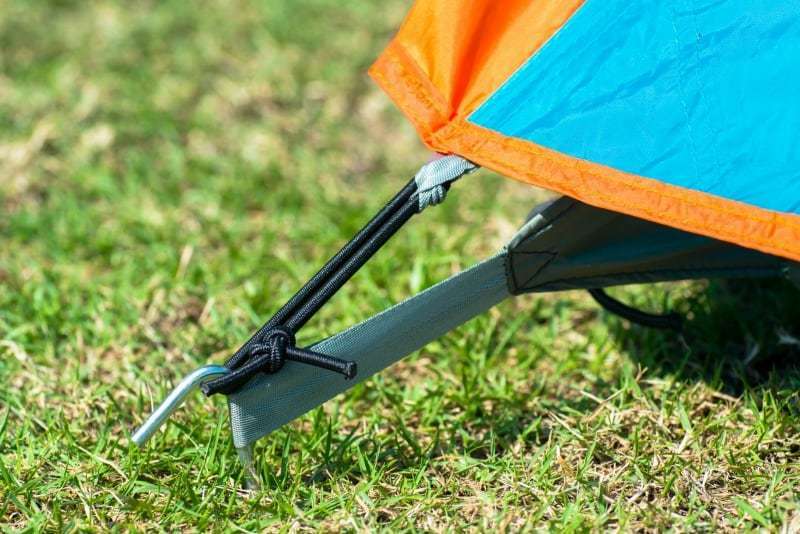 Once you get the hang of it, you will be able to set up a tarp canopy in minutes. All you really need is the right gear and location. After that you will be able to take shelter from Mother Nature as quickly as possible. In the mean time, feel free to check out camping tents which can be setup under a minute.